Susanne Winnacker: Impostor in the UK! 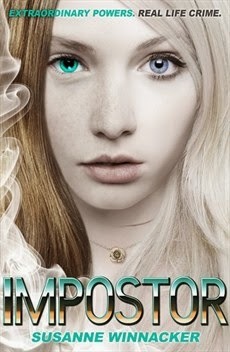 Today Impostor hits shelves in the UK! Yay! I'm very excited that my lovely UK readers finally get the chance to read my book. Tessa is a Variant, able to absorb the DNA of anyone she touches and mimic their appearance. Shunned by her family, she's spent the last two years with the Forces with Extraordinary Abilities, a secret branch of the FBI. There she trains with other Variants, such as long-term crush Alec, who each have their own extraordinary ability. When a serial killer rocks a small town in Oregon, Tessa is given a mission: she must impersonate Madison, a local teen, to find the killer before he strikes again. Tessa hates everything about being an impostor - the stress, the danger, the deceit - but loves playing the role of a normal girl. As Madison, she finds friends, romance, and the kind of loving family she'd do anything to keep. As a way to celebrate my UK publication, I'll be spending the next few days in London and I'll finally meet the wonderful people working for Hodder! I hope I'll spot my book in the wild! Happy 2014 giveaway! Win Impostor audiobooks!